The ideal time for an activity holiday in South Tyrol is March when spring arrives in the South Tyrolean Vinschgau District. Hiking, cycling, Nordic Walking and jogging are the most popular sports during spring. The Dolce Vita Hotels, 5 individually managed wellness and activity hotels, offer you a stunning home for your holiday. 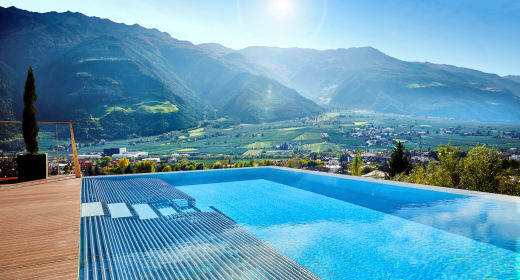 Here you will find everything you wish for on a relaxing activity holiday in South Tyrol..
You will enjoy the first sun on your skin already during breakfast and it gets warmer day by day. You prefer to spend your free time in nature? The apple blossom season in the Vinschgau District begins in March – a delight everyone should experience at least once. The morning hours in Naturns and Latsch near Merano are especially beautiful. On your jogging round you feel like nature only blooms for you. Dolce Vita for you means: holiday bliss times 5. Each Dolce Vita Wellness and Activity Hotel has its own certified Nordic Walking instructor. Two guided Nordic Walking tours in alpine altitude are on the agenda every week. You go on tour over hill and dale together with like-minded people. Nordic Walking equipment is of course available for hire at your Dolce Vita Hotel. You prefer to discover South Tyrol during your activity holiday independently? Ask for the info brochure with detailed Nordic Walking routes at the reception of your Dolce Vita Hotels. These routes are also perfect for jogging. You will be delighted by the unique variety of natural beauty in the surroundings of your Dolce Vita Hotels.